Since Mom and I had our last meal at around 1:30 p.m., by 9:30 p.m. we were dying. 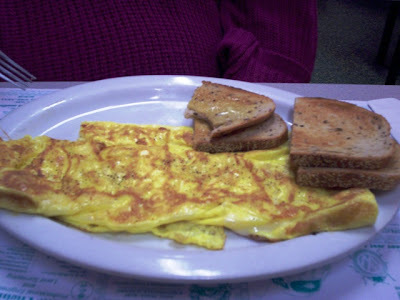 I felt like my stomach was eating its own lining, so Mom suggested that we stop by Al Mac's Diner - a Fall River institution - for an omelet. As weak as I was, I managed to make it to the restaurant, and couldn't wait to have a late-night breakfast. 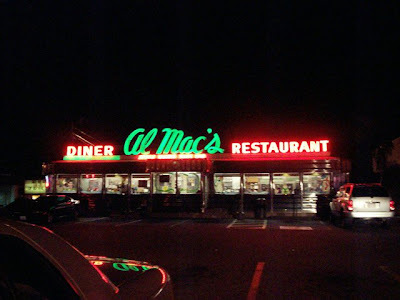 Everybody that lives in Fall River has been to Al Mac's. 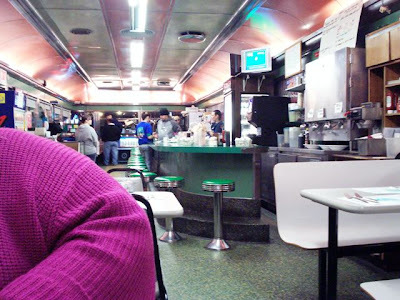 The Franklin Mint even had a pocket knife made in the shape of this restaurant during their "famous diners" series. It is definitely a collector's item, which is why my father is the proud owner of one of the knives. Housed in a large plaza close to several highway on ramps, Al Mac's is definitely a hot spot for early birds and night owls alike. When Mom and I walked in, we were greeted by a hostess who told us that we could sit along the windows to the right of the restaurant. Al Mac's has a strict seating policy with their booths, yet I always see people breaking the rules. Supposedly you are only supposed to sit at one side of the restaurant if you have a party of four or more. The remaining side is reserved for parties of two or three. The tables in the center are reserved for parties of one or two. Confused? So am I, because I often see two people sitting in the 4+ section. Mom and I quickly took our seat by the windows that face out into the parking lot. A few seconds later, we found ourselves sitting at one of the center tables. The booths here are tight - and they're immobile. Although some people won't feel the squeeze, I'm sure Fall River's larger customers are going to find it hard to be comfortable sitting in a booth at Al Mac's. Thank God they have about four movable tables and the counter area. After we finally took our seat, we were greeted by a friendly waitress named Amy. She brought over two menus and took our drink order. We ordered two Cokes, and they quickly arrived in plastic glasses. I love the soda here because it is true fountain soda - very sugary. Perhaps this is why we had so much trouble with the booths - ha, ha! Since Mom and I already knew what we wanted, Amy took our order. Mom chose the cheese omelet ($5.29) with rye toast and no home fries, and I chose the feta cheese omelet ($5.69) with rye toast and home fries. Amy took away the menus and went into the kitchen while I took some notes on the decor. A typical diner, Al Mac's is set in what looks like a giant Airstream trailer. 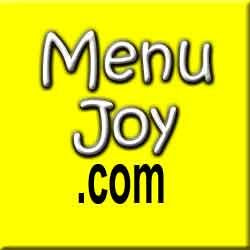 There is a large jukebox at one end of the diner and smaller ones at every booth. A large, green counter makes its way along almost the entire length of the restaurant, and booths can be found at both ends of the dining area. Large fluorescent lights shine down while Keno is shown on a few TV sets perched in the air. Condiments are set up at each table, which have been set with place mats that feature local area businesses. A lottery machine stands across from the cashier and right next to the entrance, and all the windows have been decorated with colorful snowmen for the upcoming holiday. There are boards behind the counter that list the daily specials, and although it is a busy diner setting, the restaurant is usually quite clean. Al Mac's serves typical diner food, along with some local favorites. They have quite a large breakfast menu with everything from pancakes to omelets, and breakfast is served all day. You can get eggs any way you want them, French toast, waffles, breakfast meats (Italian sausage, bacon, ham, chourico, etc. ), and their famous "S.O.S." - creamed chip beef in a white cream sauce on toast. For lunches they have burgers, hot dogs, tuna melts, and sandwiches, along with a list of appetizers that include jalapeno poppers,buffalo wings, onion rings, and fries. For dinner, Al Mac's serves the usual diner comfort food such as a turkey dinner, meatloaf, fish and chips, spaghetti, and other home style favorites. There is a dessert display case, so if you're looking for something sweet after dinner, be sure to ask your server what their specials are. Al Mac's also serves alcohol. It did not take long for the food to arrive, and this is quite typical of Al Mac's. Both plates of food smelled amazing, and we didn't waste any time digging right in. Mom thought her cheese omelet was delicious. She likes the way that Al Mac's makes their omelets. They are flat and done on the grill top. Some people like them more fluffy and baked, but she thinks that takes away from a lot of the flavor. It had just the right amount of cheese, and she really enjoyed it. Even the rye toast was great! Rye bread can get really crunchy if toasted too long, but the toast was perfect. My feta cheese omelet was very tasty. 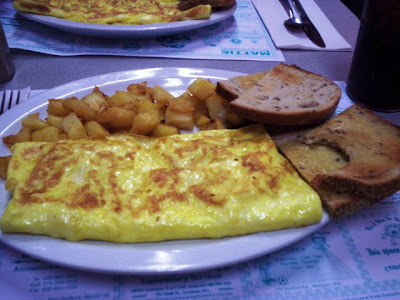 Even though I would have preferred more feta, the cheese was evenly spread throughout the entire omelet so that I was able to taste some with each bite. I agreed with Mom - the toast was delicious! Even my home fries were good. I eat them with ketchup, but these could have stood alone without any condiments. It was great. Both Mom and I almost couldn't answer Amy when she came over to ask how our meals were. Our mouths were too full! Mom and I put on our coats and handed the cashier $19, which included a 20% tip for Amy, who spotted us leaving and told us to have a good night. With our blood sugar back up, we left Al Mac's happy and satisfied. The chef tonight definitely knew how to make a good breakfast. We've had some odd experiences at Al Mac's. We've seen a few fights, some local celebrities, ran into relatives, been uncomfortable in the new booths, and have had some oddball waitresses serve us. However, we keep going back because of the good food. A lot of Fall River restaurants have come and gone, but we definitely think Al Mac's Diner will be the last one standing. Al Mac's Diner is open from 5:30 a.m. to 9 p.m. Monday through Thursday, and 24 hours on Friday, Saturday, and Sunday.